Ellen White (1827-1915): “There came to the Saviour, as if in an answer to His prayer, one in the guise of an angel from heaven… One of the most powerful of the angels [Referring to Jesus], he says, has been banished from heaven…forsaken by God, and deserted by man” (DA, pp. 118, 119). Ellen White: “He still appears as an angel of light” (DA, p. 124). J. W. McGarvey (1829-1911): “He may possibly have appeared as an angel of light” (The Fourfold Gospel). John Lightfoot (1602-1675): “By appearing to him in a visible shape and conversing with him and that in the form of angel of light…. As Eve was deceived by mistaking his person, supposing a good angel discoursed with her when it was bad, so the devil in like manner puts on the good angel here, clothed with light and feigned glory.”(John Lightfoot’s Commentary on the Gospels, Matthew 4:1-11, 1658). Matthew Henry (1662-1714): “…if ever the Devil transformed himself into an angel of light, he did so now, and pretended to be a good genius, a guardian angel…he insinuates to our Saviour, that his Father had cast him off and left him to shift for himself…thy Father hath forsaken thee…” (Complete Commentary on the whole Bible, 1706). George Whitefield (1714-1770): “…came to him as it should seem in a visible shape, and probably transformed into the appearance of an angel of light” (The Temptation of Christ). Bennett James (1774-1862): “Yet Satan, transformed to an angel of light, could not tempt our Lord, to bow down and adore” (Lectures on the History of Jesus Christ, Vol. 1, p. 96, 1828). Joseph Hall (1574-1656): “Even now is Satan transformed into an angel of Light; and will seem godly, for a mischief” (The Works of Joseph Hall, Vol. 2, p. 315, 1808). Thomas Stephen: “… and then the Devil, assuming a visible shape as an angel of light, more directly an insidiously assaulted Him whilst He was beginning to feel the pangs of hunger” (A Gospel History of our Lord and saviour Jesus Christ: or, a Life of the Man of Sorrows, p. 88, 1853). Henry Ward Beecher (1813-1887): “He might well have risen upon the saviour’s sight… as… “an angel of light”” (The Life of Jesus, The Christ, p. 126, 1871). Note: It was only an assumption that Satan appeared as an angel of light. (See Matthew 4:1-11; Mark 1: 13; Luke 4:1-13). Ellen White (1827-1915): “When Jesus entered the wilderness… But the glory departed, and He was left to battle with temptation… His human nature shrank from the conflict that awaited Him. For forty days He fasted and prayed. Weak and emaciated from hunger, worn and haggard with mental agony, “His visage was so marred more than any man, and His form more than the sons of men” (DA, p.118). Ellen White: “As soon as Christ entered the wilderness of temptation, his visage changed. The glory and splendor reflected from the throne of God which illuminated his countenance when the heavens opened before him, and the Father’s voice acknowledged him as his Son in whom he was well pleased, was now gone” (Second Advent Review and Sabbath Herald, August 4, 1874). Ellen White: “As soon as Christ entered the wilderness of temptation, his visage changed. The glory and splendor which were reflected from the throne of God and his countenance, when the heavens opened before him, and the Father’s voice acknowledged him as his Son in whom he was well pleased, were now gone. The weight of the sins of the world was pressing his soul, and his countenance expressed unutterable sorrow, a depth of anguish that fallen man had never realized. He felt the overwhelming tide of woe that deluged the world” (2Red, p. 34, 35, 1877). Ingraham J. H (1809-1860): “He [Jesus] stopped, and turned upon them a look so pale, and marred…The glory of his beauty had passed away, and the beaming splendour which shone from his countenance was wholly gone…The expression of unutterable sorrow that remained, pierced them to the heart…There must be none to help…and they [John and Lazarus] wondered most of all at the change in his countenance, which from being lustrous with celestial light, was now, said Lazarus, “Marred more than the sons of men”” (The Prince of the House of David, pp. 140, 141, 1855). Ellen White (1827-1915): “And Christ was not to exercise divine power for His own benefit. He had come to bear trial as we must do, leaving us an example of faith and submission. Neither here nor at any subsequent time in His earthly life did He work a miracle in His own behalf. His wonderful works were all for the good of others” (DA, p. 119). Ingraham J. H (1809-1860): “But I do not miracles to relieve my own sufferings. I came into this world to suffer” (The prince of the House of David, p. 201, 1855). Ingraham J. H (1809-1860): ““So far as I can learn the character and power of Jesus, His power over disease is not for His own good, but for the benefit of the multitude. He uses His power to work miracles, to do good to others from love and compassion… “It is not mine to escape human infirmities by any power my Father hath bestowed upon me for the good of men”” (The prince of the House of David, p. 175, 1855). Henry Kollock (1778-1819): “Besides, it is a beautiful trait in his life of the saviour, that he never wrought a miracle for himself… and where a miracle was required, for the relief of the unhappy, in no one instance did he withhold it. Bur never did he work one to save himself from those greifs and agonies of which he was full” (Sermons on Various Subjects in Four volumes, p. 112, 1822). Ellen White (18287-1915): “The tempter can never compel us to do evil. He cannot control minds unless they are yielded to his control. The will must consent, faith must let go its hold upon Christ, before Satan can exercise his power upon us” (DA, p. 125, 1898). Henry Blunt: “…he cannot compel the weakest follower of Jesus into smallest sin. He may entice you, beguile you, delude you, but compel, he cannot. He must have the consent of your own will, the aid of your own inclination, before he can succeed” (Lectures Upon the history of our Lord and Saviour Jesus Christ, p. 63, 1843). Thomas Stephen: “The Devil cannot force us to sin; he only suggests sinful acts to our minds, and leaves it to our own free-will to act according to his suggestions” (A Gospel History of our Lord and saviour Jesus Christ: or, a Life of the Man of Sorrows, p. 90, 1853). John Harris (1802-1856): “… it should be borne in mind, that in no instance in which Satan acquires dominion over the sinner does he obtain by force; the means which he employs are perfectly compatible with human freedom; so that the surrender of the sinner is voluntary, he sells himself to work iniquity” (The Great teacher, p. 243, 1835). Ellen White (1827-1915): “After the foe had departed, Jesus fell exhausted to the earth, with the pallor of death upon His face…The angels now ministered to the Son of God as He lay like one dying. He was strengthened with food, comforted with the message of His Father’s love and the assurance that all heaven triumphed in His victory” (DA, p. 131, 1898). Thomas Brown (1778-1820): “When the tempter was gone, a number of good angels came and ministered unto Jesus, bringing him food and everything else he had need of” (The Self-explanatory History and Life of Our Blessed Lord and Saviour, Jesus Christ, p. 90, 1814). Ellen White (1827-1915): “He not only became an exile from the heavenly courts, but for us took the risk of failure and eternal loss” (DA, p. 131). Edward Griffin (1770-1837): “After wandering an exile from heaven for more than thirty years for our revolt…” (Sermons By The Late Rev. Edward Griffin, Vol. 2, p. 477, 1838). Octavious Winslow (1808-1878): “Exile from His Father was no small element in the abasement of our adorable Redeemer – To leave the bosom of the Father…” (The Glory of the Redeemer, p. 71, 1844). Ingraham J. H (1809-1860): “… when his exile to the desert would terminate…” (The Prince of the House of David, p. 137, 1855). Talmage, T. De Witt (1832-1902): “The exile of heaven lieth down upon the straw; the first night out from the palaces of heaven, dressed in a wrapper of coarse linen” (From manger to Throne, p. 168, 1890 [first edition 1880]). Ellen White (1827-1915): “But he does not appear as a hideous monster, with cloven feet and bat’s wings” (DA, p.129). 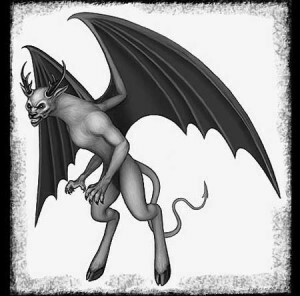 Ellen White: “He was face to face not with a hideous monster, as is represented with bat’s wings and cloven feet, but as a beautiful angel of light…”(16 MR, p. 181, 1990). Walter Scott (1771-1832): “the fiends are painted as assisting them, portrayed in all modern horrors of the cloven- foot, or as the Germans term it, horse’s foot, of bat-wings, saucer-eyes, locks like serpents, and tail like a dragon” (The Complete Works of Walter Scott, p. 1018, 1833). Daniel Defoe (1660-1731): “… who cheated the ignorant world with a devil of their own making, set forth in terror, with bat’s wings, horns, cloven foot, long tail, forked tongue, and the like” (History of the Devil, p. 176, 1854 [first published in 1726]). George Sinclair (1654-1696): “… an Ancient Man came in his amber coloured hair hanging down upon his shoulders, his forehead high, and inclining to baldness…” (Satan’s Invisible World Discovered, p. 39, 1685). 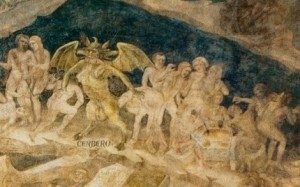 Note: By her own admission, her information about the Devil’s appearance came from earlier paintings. Listen to the following statement: “As I have seen pictures representing Satan coming to Christ in the wilderness of temptation in the form of a hideous monster, I have thought, how little the artists knew of the Bible! Before his fall, Satan was, next to Christ, the highest angel in heaven” (RH, January 14, 1909). While criticizing the artists for distorting the true identity of Satan on the one hand, she too, followed their footsteps in describing Satan as a hideous monster. Listen to this inspired description: “That brow which was once so noble, I particularly noticed. His forehead commenced from his eyes to recede. I saw that he had so long bent himself to evil that every good quality was debased, and every evil trait was developed. His eyes were cunning, sly, and showed great penetration. His frame was large, but the flesh hung loosely about his hands and face. As I beheld him, his chin was resting upon his left hand. He appeared to be in deep thought. A smile was upon his countenance, which made me tremble, it was so full of evil and satanic slyness. This smile is the one he wears just before he makes sure of his victim, and as he fastens the victim in his snare, this smile grows horrible” (EW, pp. 152, 153). 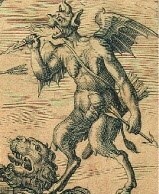 George Sinclair (1654-1696): “…and the Devil at this time appeared to them very terrible, with claws on his hands and feet, and with horns on his head, and a long tail behind” (Satan’s Invisible World Discovered, p. 186, 1685). Ellen White (1827-1915): “But since that time the Saviour’s appearance had greatly changed. At His baptism they had seen His countenance transfigured in the light of heaven; now, pale, worn, and emaciated, He had been recognized only by the prophet John” (DA, p. 137). Ingraham J. H (1809-1860): “He tuned his pale countenance upon me, and extended towards me his emaciated hands….worn to a skeleton, weak through suffering” (The Prince of the House of David, p.136, 1855). Ellen White (1827-1915): “Jesus comes in poverty and humiliation” (DA, p. 138). Ingraham J. H (1809-1860): “He comes in poverty and humility” (The prince of the House of David, p. 143, 1855). Ingraham J. H (1818-1860): “… the true Son of the Highest, and is in reality to make His appearance ere long, in humiliation and poverty” (The Prince of the House of David, p. 74, 1855). Ellen White (1827-1915): “Yet He is not the same. His countenance is changed. It bears the traces of his conflict in the wilderness, and a new expression of dignity and power gives evidence of His heavenly mission” (DA, p. 145). Ingraham J. H (1818-1860): “He was pale, and wore an expression of gentile, uncomplaining suffering on His benign countenance. His calm, chastened, dignified aspect, the serene composure and peace of His looks, awed me…” (The Prince of the House of David, p. 138, 1855). Ellen White (1827-1915): “Death had separated her from Joseph, who had shared her knowledge of the mystery of the birth of Jesus. Now there was no one to whom she could confide her hopes and fears” (DA, p. 145). William Hanna (1808-1882): “She had none at Nazareth but Joseph to speak to; none but he who would have believed her had she spoken. Joseph now is dead, and she is left to nurse the swelling hope in her solitary breast” (The earliest years of our Lord’s life on earth, p. 246, 1864). Ellen White (1827-1915): “The parties were relatives of Joseph and Mary” (DA, p. 144). Ellen White: “As a relative of the parties Mary had assisted in the arrangements for the feast” (DA, p. 146). J. Sadler: “His mother being already there, her care concerning the feast, induces the opinion, that it was the marriage of some relation” (Sacred records of The History of Our Lord and saviour Jesus Christ, p. 55, 1835). Louisa parry: “It was the marriage, probably, of some relation of the Virgin Mary; for she is spoken of as being there, as though she had been at home, one of the family party” (The young Christian’s Sunday evening; or, Conversations on Scripture history, p. 104, 1837). Ingraham J. H (1809-1855): “His mother and many of her kinsfolk were of the company, all going to a marriage of the cousin of the family” (The Prince of the House of David, p. 147, 1855). Martin Luther (1483-1546): “His mother is present as the one arranging the wedding, the parties being apparently her poor relatives or neighbours” (Luther’s sermon, Sermon for the Second Sunday after the Epiphany; John 2:1-11, 1525). Joseph Hall (1574-1656): “It was in all likelihood some of their kindred, to whose nuptial feast they were invited so far” (The Works of Joseph Hall, Vol. 2, p. 323, 1808). Samuel J. Andrews (1817-1906): “The mother of Jesus seems to have been intimate in the family where the wedding took place, from which it has been inferred that she was a relative of one of the parties” (The Life of Our Lord upon the Earth, p. 149, 1863). Ellen White (1827-1915): “It was the custom of the times for marriage festivities to continue several days. On this occasion before the feast ended it was found that the supply of wine had failed” (DA, p. 145). Albert Barnes (1798-1870): “A marriage feast among the Jews was commonly observed for seven or eight days. It is not probable that there would be a want of wine at the marriage itself, and it is possible therefore that Jesus came sometime during the marriage feast” (Barnes’ Notes on the Whole Bible, 1834). Henry Ward Beecher (1813-1887): “… a Jewish wedding was seldom less than three days and usually of seven days’ of duration, and was conducted with most joyful festivities…” (The Life of Jesus The Christ, p. 184, 1872). F. W. Farrar (1831-1903): “Whether the marriage festival lasted for seven days, as was usual among those who could afford it, or only for one or two, as was the case among the poorer classes, we cannot tell” (Life of Christ, Vol. 1, p. 76, 1874). Ellen White (1827-1915): “By attending this feast, Jesus honoured marriage as a divine institution” (DA, p. 151). Ellen white: “he came to give to men the cup of blessing” (DA, p. 144). Joseph Hall (1574-1656): “He, that made the first marriage in Paradise, bestows his first miracle upon a Galilean marriage. He, that was the author of matrimony and sanctified it, doth, by his holy presence, honour the semblance of his eternal union with his church” (The Works of Joseph Hall, Vol. 2, p. 323, 1808). Ellen White (1827-1915): “He found pleasure in scenes of innocent happiness, and by His presence sanctioned the social gathering… We are not to renounce social communion. We should not seclude ourselves from others” (DA, pp. 151,152). Ellen White: “Thus He showed His sympathy with men, and His desire to minister to their happiness” (DA, p. 144). Ellen White (1827-1915): “Instead of secluding Himself in a hermit’s cell in order to show His heavenly character, He labored earnestly for humanity” (DA, p. 86). Cunningham Geikie (1824-1906): “Jesus came to spiritualize the humblest duties of life, and sanctify its simplest incidents, so as to ennoble it as a whole. Henceforth, pleasures and enjoyments were not to be shunned as unholy; religion was not to thrive on the mortification of every human instinct, and the preservation of every cheerful emotion” (Life and Words of Christ, vol.1, p. 475, 1879). Henry Kollock (1778-1819): “His unsullied holiness was never mingled with misanthropy, but always blended with the gentlest condescension; and his religion permits us innocent enjoyment … He did not seclude himself in the retirement of a cloister, or the obscurity of a wilderness, but conversed freely and indifferently with all men: honouring their tables with his presence, complying with the innocent practices that custom authorized” (Sermons on various Subjects in Four Volumes, p. 144, 1822). Ellen White (1827-1915): “She longed to have Him prove to the company that he was really honoured of God. She hoped there might be opportunity for Him to work a miracle before them” (DA, p. 145). John Fleetwood: “She had doubtless, conceived he had the power of working miracles, and was therefore desirous that he would give proof of his ability in the presence of her friends, who were assembled at the marriage” (Life of Our Lord and Saviour Jesus Christ, p. 29. 1821). J.W. Mc Garvey (1829-1911): “She practically requested him to work a miracle, nor is it strange that she should do this. Remembering the many early sayings about him which she treasured in her heart, the incident at his baptism etc., it would be reasonable for her to expect him to do something which would reveal the high purposes for which he had been born” (The Fourfold Gospel). Jamieson (1802-1880): “Evidently expecting some display of His glory, and hinting that was His time” (Commentary Critical and Explanatory on the Whole Bible, 1871). Ellen White (1827-1915): “The gift of Christ to the marriage feast was a symbol. The water represented baptism into His death; the wine, the shedding of His blood for the sins of the world… At the first feast He attended with His disciples, Jesus gave them the cup that symbolized His work for their salvation…in the institution of that sacred rite by which His death was to be shown forth “till He come.” 1 Corinthians 11:26. And the sorrow of the disciples at parting from their Lord was comforted with the promise of reunion, as He said, “I will not drink henceforth of this fruit of the vine, until that day when I drink it new with you in My Father’s kingdom.” Matthew 26:29. At the last supper He gave it again…The wine which Christ provided for the feast, and that which He gave to the disciples as a symbol of His own blood, was the pure juice of the grape” (DA, pp. 148, 149, 1898). Robin Margret Jensen: “Tertullian (160-220 AD) regards the Cana miracle as a figure of baptism because it was then that Jesus publicly manifested his power by the element of water” (Living Water: Images, Symbols, and Setting of Early Christian baptism, p. 279, 1952). Robin Margret Jensen: “Cyprian (200-258 AD), referring to the mixing of wine and water in the Eucharistic cup, interprets the water as representing God’s people and the wine the blood of Christ” (Baptismal imagery in Early Christianity, p. 202, 1952). T. Thompson: “Eucharist is represented as affecting a mysterious change in the elements by which they become the body and blood of Christ. Cyril (313-386 AD) of Jerusalem had already appealed to the miracle of Cana as affording a parallel to this change” (St. Ambrose on the mysteries, p. XXXVI, 1919). William B. Pope (1822-1903): “It is this that our Lord’s wisdom, which looks through the immediate occasion into the widest connexions of his truth, and contemplates in the individual circumstances of the present the last futurity which they prettify, addresses itself now. When He says, My hour is not yet come, he is thinking, we may presume, in His secret mind (we dare so boldly to penetrate the depths of His thoughts) of that time when all shall be fulfilled, which the wedding-feast at Cana, and the cheerful wine – the first gift of his saving power and kindness – symbolically foretold. That hour of His established kingdom, when the fruit of the grape shall be drunk new, is not yet come” (The Words of Our Lord Jesus, p. 65, 1855). Jeremy Taylor (1613-1667): “He entered into the theatre of the world at a marriage feast, which he now first hallowed to a sacramental signification, and made it to become mysterious… and consign the sacrament by his blood, which he first gave in a secret representment,… by his presence, he also hallowed marriage and made it honourable” (The Life of Our Blessed Lord and Saviour Jesus Christ, pp. 121, 122, 1834). Ellen White (1827-1915): “When at length they looked for Him, it was found that He had withdrawn so quietly as to be unnoticed even by His disciples” (DA, p.150). Ingraham J. H (1809-1860): “…and the governor of the feast crying out, ‘A prophet hath been among us, and we knew it not,’ rose to approach and do honour to Jesus; but he had already conveyed himself out through the door, and sought the solitude of the garden” (The prince of the House of David, p. 150, 1855). Note: John did not say that Jesus withdrew unnoticed, but that He went along with His family and the disciples (John 2:12). Ellen White (1827-1915): “Many were unable to bring with them the sacrifices that were to be offered… For the convenience of these, animals were bought and sold in the outer court of the temple… Here all foreign money was exchanged for the coin of the sanctuary…The dealers demanded exorbitant prices for the animals sold” (DA, p. 154, 155). Ingraham J. H (1809-1860): “…sat at their tables men whose business it was to change the foreign money…for Jerusalem and Roman coin which only the sellers of the cattle and sheep will receive for what they sell” (The Prince of the House of David, pp. 185, 1855). B.W. Johnson (1833-1894): “The great crowds who came to Jerusalem at that time could not bring victims … Gentile money was the coin in circulation, and this was refused at the temple. These money brokers, agents of the priests, furnished Jewish coin at a heavy charge” (People’s New Testament, 1891). August Neander (1789-1850): “On visiting the temple, he found its worship disturbed by disorders which desecrated the holy place – a picture of general secularization of the Theocracy. For the convenience of the Jews from a distance who wished to offer sacrifices, booths had been erected in the Temple-court, in which everything necessary for the purpose was kept for sale, and money changers were also allowed to take their stand there” (Life of Jesus Christ in its Historical Connexion and historical Development, pp. 168, 169, 1848). Ellen White (1827-1915): “There could be heard sharp bargaining… and angry disputation. So great was the confusion that the worshippers were disturbed, and the words addressed to the Most High were drowned in the uproar that invaded the temple” (DA, p. 155). Thayer, Erastus William (1812-1902): “… coupled with the voices of traders and customers necessarily shouting out loudly the hagglings of trade. Amid the continuous babel of sounds, a devout and intelligent worship was impossible… The worship of mammon was silencing the worship of Jehovah” (Sketches from the life of Jesus, Historical and Doctrinal, p. 80, 1891). August Neander (1789-1850): “The merchants and the brokers made everything subservient to their avarice, and their noisy huckstering was a great disturbance to the worship of the Temple” (Life of Jesus Christ in its Historical Connexion and historical Development, p. 169, 1848).